If you are unable to view any of the screenshots clearly please zoom in! To get started, first navigate to the Scheduler tab. 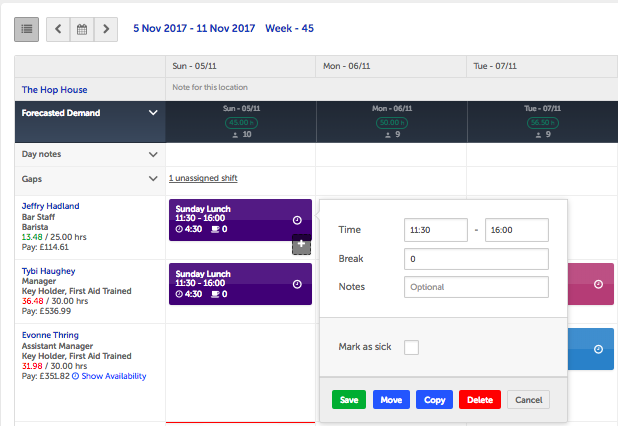 To familiarise yourself with the Scheduler, first check out our article on Navigating The Scheduler. To create a shift, simply hover your mouse over the box on the Scheduler where you want to add the shift. A grey plus sign will then appear. Click on this plus sign to open the shift creation dialogue box. On the Tablet version of Rotageek, you'll see that the grey plus signs appear automatically when you load up the Scheduler. Click on this to launch the shift creation dialogue box. On both your desktop computer or tablet, the next step is to choose between New or Existing shifts and Leave. When adding a New shift, enter the shift times and break duration in the dialogue box and click Save. This will add your shift to the schedule. Notes are optional and can be used to remind employees about key tasks or events that shift, e.g. 'Re-stock bar'. Your Notes will visible to an employee when they view their shifts on the Employee Mobile App. Existing shifts are pre-loaded shifts that occur regularly to help you save time building your rota. To learn how to set up Existing shifts, take a look at our article Scheduling Shortcuts. To add an Existing shift, click on the Existing tab and select the shift you want to add to the Scheduler. You can add Non-Requestable Leave to the Scheduler. This covers types of leave and absences that employees cannot request, such as sick leave. To find out more about Requestable and Non-Requestable Leave click here. In the case of Sick Leave, in most instances you won't know in advance that your employee is going to be ill. 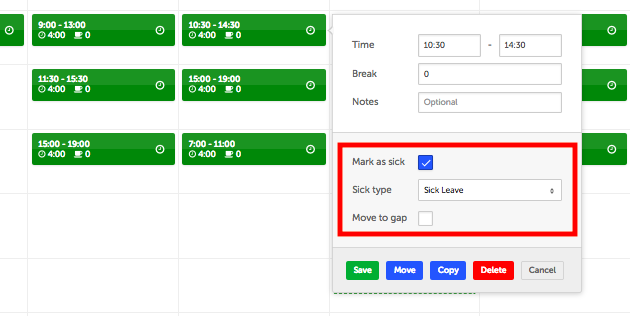 If you team member informs you of their absence at short notice and you have already scheduled them a shift, you also have the option to Mark them as Sick on the Scheduler. Simply click on the affected shift, and tick Mark Sick. 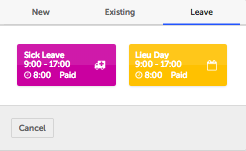 Requestable Leave such as annual leave that has been approved will appear in the Scheduler automatically. Check out Approving or Rejecting My Employee's Leave for more information. 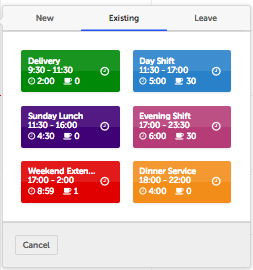 You can edit both New shifts, Existing shifts and Leave that you've added in the Scheduler. Click or tap on the shift you want to edit and a dialogue box will appear which allows you to edit the time, break duration and shift notes. You can also move or copy the shift to another person or day. You can delete the shift by clicking the Delete button. 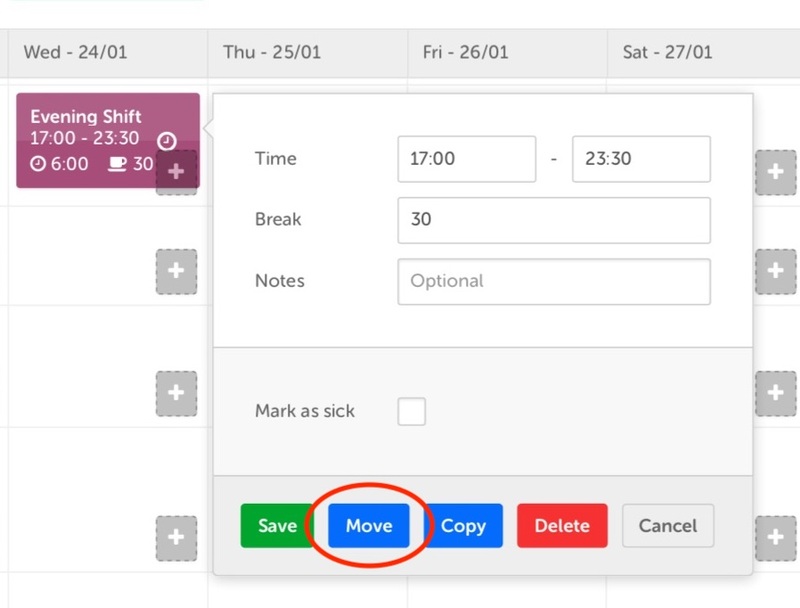 On your desktop computer you can easily drag and drop shifts around the Scheduler. On your tablet we recommend using the Move function. 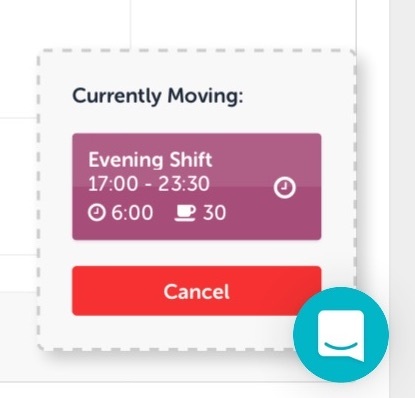 If you want to move a shift to another place on the Scheduler, tap the shift then click the blue 'Move' button at the bottom of the dialogue box. In the bottom right corner of your screen you'll now see the 'Currently Moving' box showing you the shift you selected to move. To drop that into a new place in the Scheduler, just click the grey plus button where you want to add it. When you add a shift or edit a shift in the Scheduler, it will appear in a grey with a green dotted line around it. This means that the shift is in Draft. Draft shifts will not be visible to your team. Once you've built your schedule, you need to approve it to finalise the rota. To do this, click the green Approve Changes button in the top right corner of the Scheduler. This will send a notification to your employees letting them know that their shifts have been updated. Want to Learn More About Scheduling? 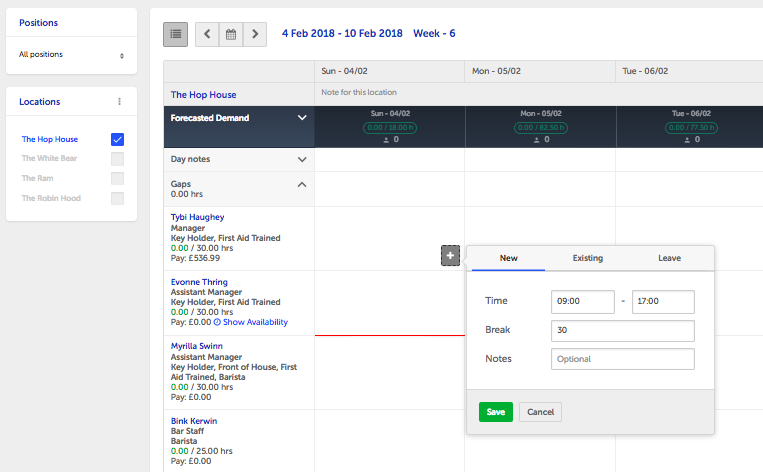 Now you know how to create, edit and approve shifts in the Scheduler, head over to Scheduling Shortcuts to find out more about Rotageek's timesaving Scheduling functions such as creating shift templates.